If you want to really understand beer, try brewing it yourself. Using a kit from the homebrew shop is a good place to start, but to get an even better feel for the process, nothing beats producing beer from raw ingredients on proper kit. By breathing in the malt dust, crunching the malted grains between your teeth, sampling the wort, sniffing the hops and finally tasting the beer as it matures, you get your head all the way around how this glorious liquid is created. Great Food Club got the chance to do just that at Bexar (pronounced ‘Bear’) County Brewery in Peterborough, Cambridgeshire. Bexar County Brewery was founded by Texan Steven Saldana just over a year ago. 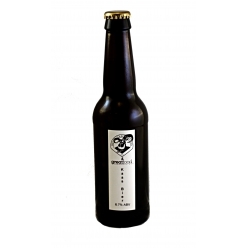 Steve prides himself on his freestyle, anything-goes approach and has come up with inventive beers like Texas Pecan Coffee Mild, La Perla Negra En Fuego (made with hatch chillis), Come And Get It (a deceptively strong imperial red ale) and Papa Steve (an imperial American stout). After meeting Steve for a beer, we decided to try to create a drop of our own that would work beautifully with cheeses and charcuterie. It would be a pale-coloured, mildly citrussy beer with plenty of hop aroma but without an in-your-face hoppiness on the palate. We wanted to give our beer a malty spiciness and a strength that would cut through fats to refresh the mouth, but also, of course, taste great. 1. Steve identified four types of malts to provide the taste we wanted: Maris Otter Pale, Caragold, Munich and White Wheat. I tried all four and the difference in the flavour of each was huge. Using different malts is the first tool a brewer can use in his quest to create different styles and flavours. 2. In a large vessel (the mash tun), the malts were added to 180 gallons of water raised to 81°C (but falling to 65°C once mixed with the malts). This was left to mash for an hour, during which time the malts release sugars. 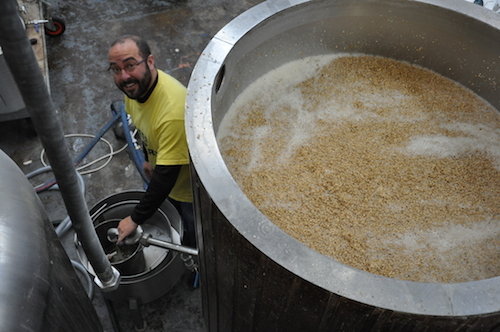 The hotter the water in which the grains mash, the thicker the mouthfeel of the final beer. 3. After an hour, some of the liquid (now referred to as ‘wort’) was drained and tipped back on top of the grain bed. 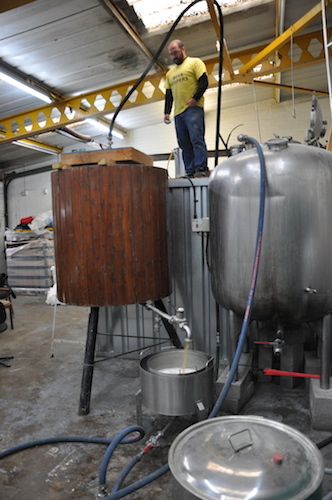 This process is known as ‘vorlauf’ and helps to clarify the wort. 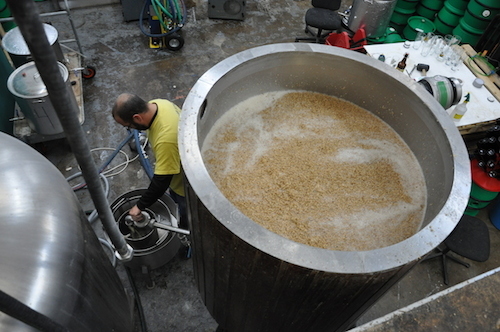 After the ‘vorlauf’, the mash was sprinkled with hot water – known as sparging – to extract even more sugar. 4. During the sparge, all the wort was drained from the mash tun and transferred into the copper kettle, where it was boiled for exactly 60 minutes. 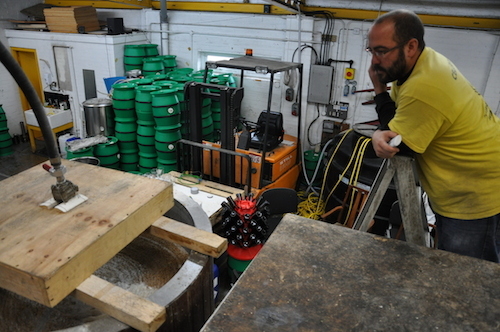 Steve stressed the importance of ensuring it was a rolling boil, not just a simmer – crucial for driving out oxygen and encouraging various chemical processes. 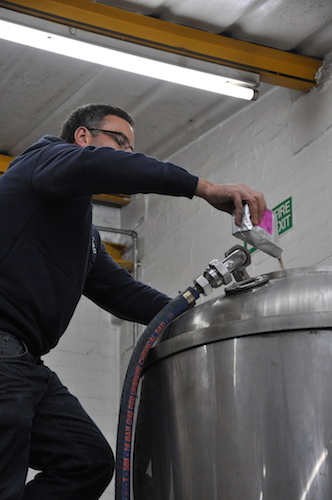 The length of the boil is another tool that the brewer can use to control characteristics of the final beer. 5. 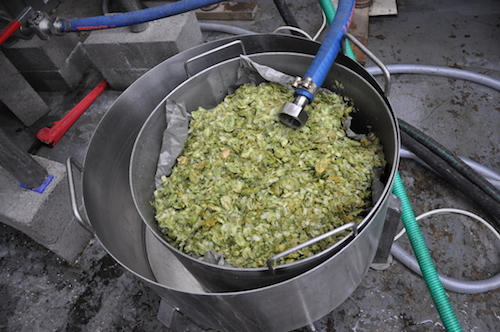 During the boil, two types of hops were introduced. Nugget was added with 15 minutes of the boil to go and Pacific Gem was thrown in at the end. The earlier that the hops are added, the more hop flavour and bitterness is imparted. The layered additions of hops during the boil is a real art form as it can have a huge impact on final flavour. At the end of the boil we also added 50g of peppercorns to introduce spiciness. 6. After the boil, the wort was transferred from the kettle to the fermenting tank via clean pipes. On its way, the liquid was passed through a ‘hopback’ containing Cascade and Citra hops. 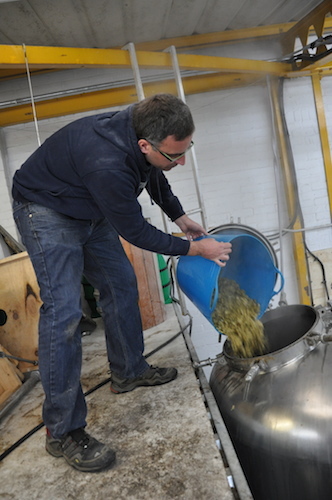 Using a hopback allows you to introduce hop aroma rather than intense hop flavour. Because the hops aren’t boiled in the wort but merely passed through, they don’t release as much of their potent oil. 7. Finally, the wort was put through a heat exchange (dropping the temp from 100°C to 22°C ) and into the fermentation tank. 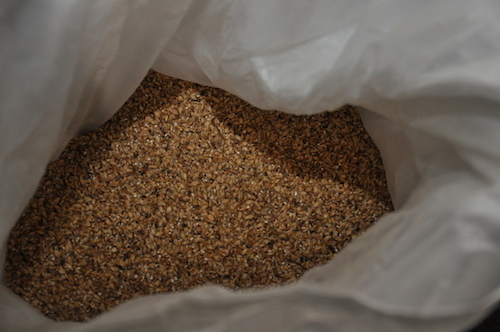 Yeast was added – a Belgian variety that gives a spicy flavour. Getting the wort temperature down is crucial as yeast is most active at 20-25C. The wort was left to ferment for two weeks and then transferred to cask until ready to drink. The final specific gravity was 1070, which should produce a 6.7% beer. 8. 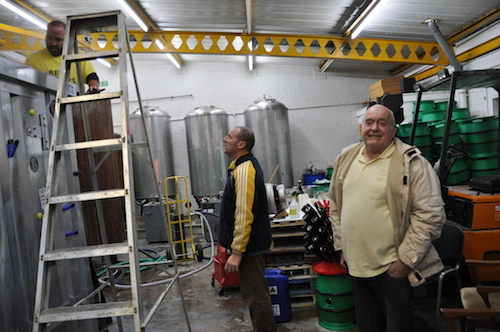 After the brew, the spent malts were picked up by Peterborough farmers Alan Durose and Matthew Clifton. A month later I returned to taste the beer. I was impressed. Aromas of banana, caramel, spice and strawberry hit the nose. Then the 6.7% ABV pale-golden beer transferred this fruitiness to the palate – along with sweet, peppery spice – before giving way to a crisp, bitter finish. We named it Kaas Bier (‘kaas’ is Flemish for ‘cheese’) because it has similar characteristics to certain Belgian Trappist beers and goes superbly with a cheeseboard. For a short time only, Kaas Bier is available to buy through online retailer, The Ale Room. Click here to buy. Join Great Food Club – free – and save money on beers purchased from The Ale Room.